Helsinki Region Transport (HSL) has recently organized a hackathon for further improving their Journey Planner. 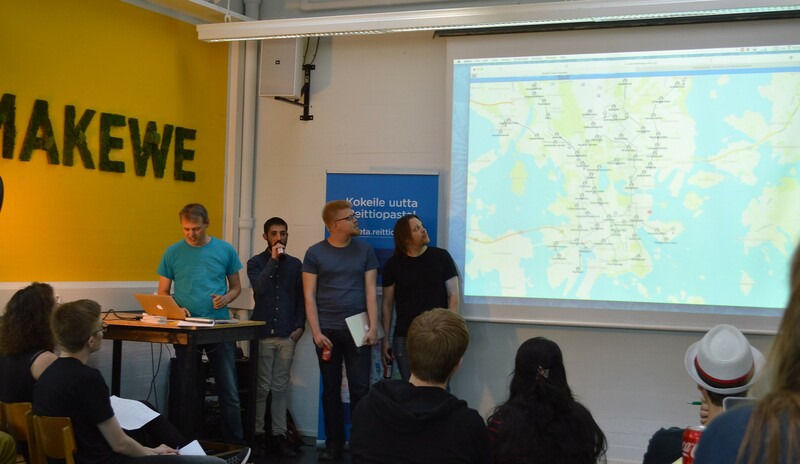 The hackathon featured 9 teams with very different approaches to solving the given task. The winning project targets customers from different special needs groups (e.g. visually impaired), as well as children and the elderly. 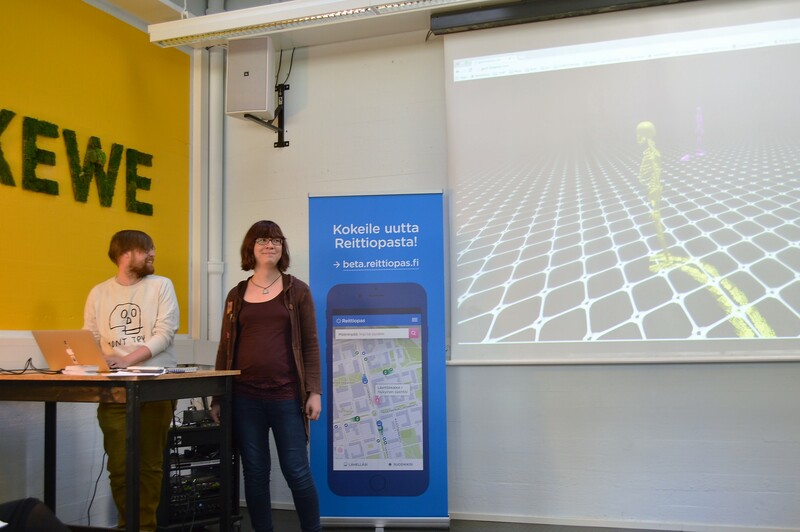 The hackathon was supported by HSL’s partners: Liikennevirasto, Helsinki Think Company, CGI, Netlight, Nitor, Palmu and Visma. We’ve visited the hackathon and interviewed some of the participants about their projects and the problems they were trying to solve with their ideas. The event was positively evaluated by all the interviewed participants. They claimed that the organizers were very helpful and the teams enjoyed spending time together and working on their project in a friendly and dynamic environment. Henna Kalliokoski, a member of the winning team “STOP 2.0” describes their idea: “The main purpose of “STOP 2.0” is to allow the traveler to inform the driver about their wish to stop the bus. The application uses small iBeacon Bluetooth transmitters for location. Both the buses and the stops have iBeacon transmitters, so the user is able to identify the beacon and ask the driver to stop at the right place: either from the bus stop for the approaching vehicle or from inside the bus. 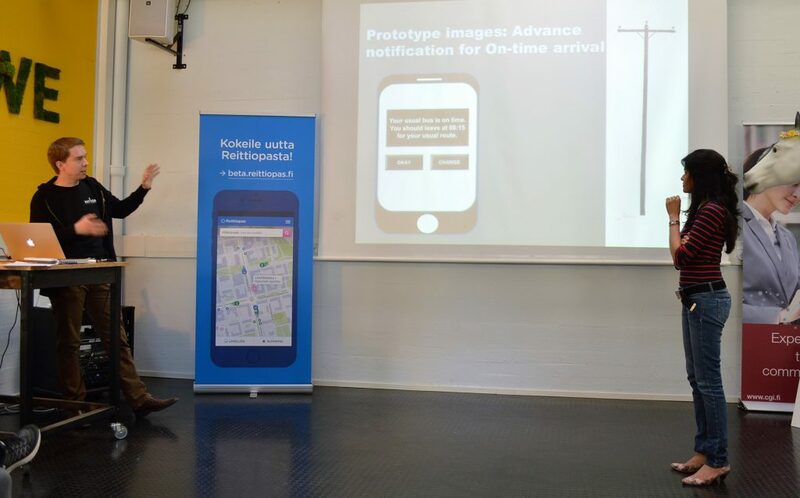 “STOP 2.0” makes use of the new driver’s devices of Helsinki Region Transport. The driver’s device is a computer that supplies real-time information about the traffic and locations of the other vehicles on the same route. “STOP 2.0” is integrated into the driver’s device to notify the driver about the need to stop at a certain bus stop. 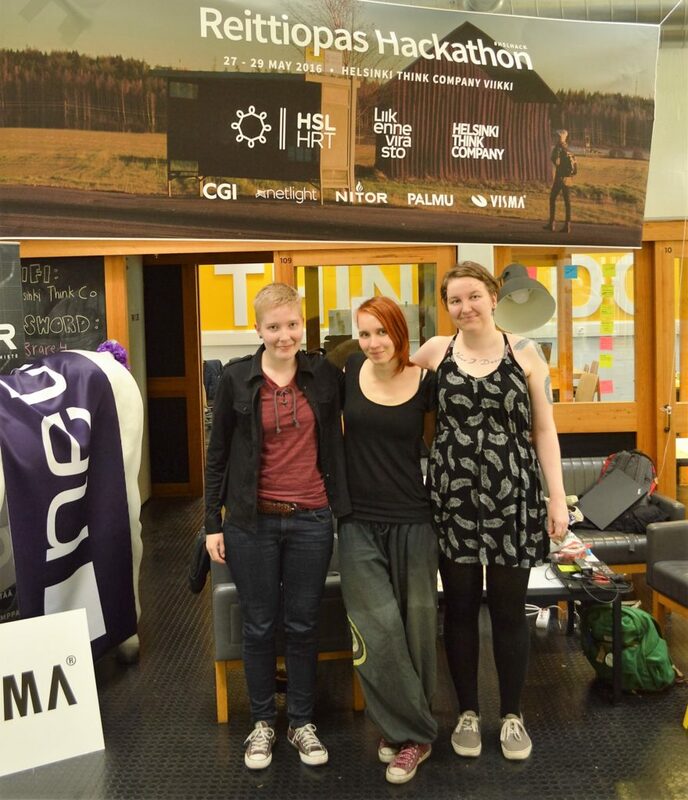 Team members: Pihla Toivanen, Tintti Rahikainen, Ronja Oja and Jenny Tyrväinen. All the team members are computer science students living in the capital area. Miranda Kastemaa from team “Gaidi” presents their fun experiment: “Our project is an experiment in generative art that transforms real-time tram location data into a spooky audiovisual experience. Trams are represented by skeletons jumping around in a desolate world, consisting of drum machine pads that trigger different sounds. Being passionate about graphics and audio programming, it seemed like the obvious thing to do when I heard about the real-time location API offered by HSL. We started out with some basic wireframe cubes moving around, and the finer details of the concept emerged over the weekend. The skeleton theme may have been inspired by Skull Trumpet and Dark Souls. Team members: Miranda Kastemaa, software engineer and electronic musician, and Wolf Wikgren, master’s student at Aalto ARTS and web developer. Team “Just in time!” created an app, aimed at saving commute time for the users. Rashmi Kasat tells: “Our app uses traveler’s personal history data of commute (usual starting point, usual destination, usual schedule etc.) and combines it with the real-time transport data to create personalized alerts for the user. It notifies the user of the precise time they need to leave for their stop, so that they are at the stop just in time (not too early and not too late). The user is also notified if he/she misses the bus, or there are disruptions on the desired route and proposes the time they should leave for the next bus. Team members: Rashmi Kasat, Director and Head of Digital Services Practice at Capgemni, and Mika Majakorpi. Senior Software Architect at Nitor. Team members: Stephen Sykes, Matias Korhonen, Joao Cardoso, Krister Kari.